As I was working this Saturday morning and couldn't make it to Kirkcaldy to see Partick Thistle tackle Raith Rovers, I decided to avoid being glued to my phone for twitter updates from @ThistleTweet by seeing what else was on in Glasgow. After a quick dash into town I made it in time for the matinee performance at the Theatre Royal of The Cone Gatherers by Aberdeen Performing Arts. As I had got the subway into town this is an excuse for me to post my photo of Alasdair Gray's fantastic mural at Hillhead station, which I got to have more of a look at this time as Nicola Sturgeon wasn't standing in the way after cutting the ribbon to open the station. The Cone Gatherers by Robin Jenkins is a "classic" of Scottish literature and I think a common text for Higher English students, but I hadn't read it until last year when I was given it as a birthday present. The author was a conscientious objector during WW2 and was directed to work for the Forestry Commission, an obvious source of inspiration for the book. Set during the war, two brothers are sent to an large estate to gather cones to replant forests being cut down for the war effort. Like George and Lennie from 'Of Mice and Men', older brother Neil tries to protect his simple-minded brother Calum from the evil in the world and the attitudes of others. Their arrival unveils the prejudices and class division of the world they inhabit. The play, written by Peter Arnott, looked great. The set design of projections of a forest onto thin ropes hanging down on the stage worked really well and was very immersive. However I found the story very episodic, as if they had tried to squeeze every scene from what is quite a slim book into the play. When they couldn't quite manage this they had a chorus walking across stage explaining bits that could more effectively have been given to a character as dialogue. Some things can be more powerful when they are suggested, or off stage, rather than shown, such as Duror's wife, who appeared like a Hammer Horror monster. There was the unecessary confusion of where the songs, or dance moves fitted into the, at other times, straight storytelling. The chopping and changing of techniques rather meant scenes such as the dramatic crescendo to the deer hunt became quite muddled. The actors playing Calum (Ben Winger), Neil (John Kielty) and Duror (Tom McGovern) did well, and the idea of showing Duror's aggression at Calum's strangeness echoing Hitler's fascism worked well. However Calum, Neil and Duror never seemed to get enough material to work with to have any real depth to them. I enjoyed it, but had hoped for a little more insight and a bit less re-telling of the book scene by scene. It is always a bit weird coming out of the theatre or cinema and it's still daylight so as Partick Thistle were losing 1-0 at this point I decided to scuttle off back into the dark after a quick bite to eat in the CCA which has a fine pine of Williams Draught beer on the go for £2.80 a pint. So I scuttled back into the dark by going to the GFT to see Holy Motors by French director Leos Carax. 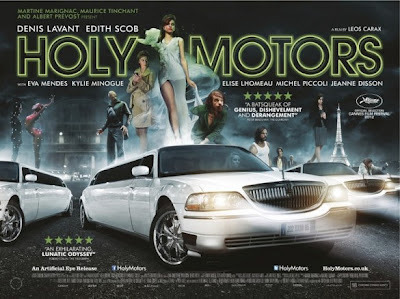 Holy Motors is completely bonkers. It is the opposite to what I had been to see earlier where a play tried to tell a book's story page by page, when theatre can do more than that. Cinema can do more than tell a straight story too. You spend time here trying to see the link between the different scenarios of the film and discern a message, but it just works as a fantastic bit of cinema washing over you. The director starts by getting out of bed, pushing through a wall decorated as a forest (today's theme) and emerging into a cinema which is maybe full of an audience of dead people. Then we follow Denis Lavant, who looks fantastically worn out, through Paris in a limo as he dons different costumes and make up to act out various "appointments" across the day. These are like confusing episodes of "Quantum Leap" where the angel figure doesn't really have a purpose in the scenes he undertakes, other than just the act of doing what he has been scripted to do. At times bizarre, surreal, full of pathos or hallucinatory and for real cinemaphiles these appointments I am sure are full of various references and nods to the history of cinema, ending up like a scene from Cars as the limo ends the day at its garage. Just when you think it's getting a bit weird Kylie turns up. Excellent stuff all round. I would encourage anyone who gets the chance to go see it. I suspect people will either love it or hate it, it's a hard film to be ambivalent about. Anyway, by this point Partick Thistle had equalised with a Doolan goal in injury time through in Fife. STILL unbeaten after 7 league games, but only just. Can we start thinking about the "promotion" word yet?? ?